A source close to the Independent Electoral Commission has just informed us that there is an atmosphere of uneasiness at the IEC offices because of the unfavorable numbers (to Jammeh) that have started to coming in from the field after the polls closed an hour and a half ago. As the votes start rolling in, the pattern is clear that Adama Barrow is leading Jammeh by a wide margin. The pattern has been evident from the start of voting this morning that the seven-party Coalition led by Adama Barrow is leading Jammeh. The dilemma facing the Electoral Commission is if they announce the real results that will undoubtedly favor the Coalition, a section of the army led by Chief of Defense Staff, General Ousman Badgie men attack members of the IEC and supporters of the Coalition of opposition parties. Alternatively, any announcement contrary to what the results show will pose an equally daunting challenge of having to defend a result that is against the will of the Gambian people. More information is being received from sources intimate with Independent Electoral Commission that many of the Commission's Returning Officers fear for their lives because of the figures are clearly in favor of Adama Barrow. 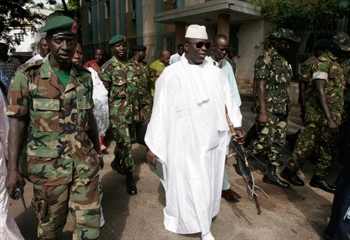 and against Yaya Jammeh who is being resoundingly rejected by the Gambian people. UP-DATES - We will continue to bring you the latest development as and when they happen.